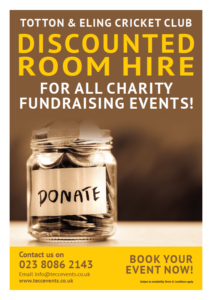 Discounted Room Hire for all Charity Fundraising Events! Quiz Night – Disco Party – Race Night – Ball – Band Night – Karaoke Party – Ladies Night – Themed Party – Live Entertainment – Physic Night – Dinner Dance – The choice is yours! In light of our commitment to support national and local charities, we are delighted to offer DISCOUNTED ROOM HIRE for Charity Fundraising Events. Discounted room hire is available on a Monday, Friday or Sunday evening. We also offer FREE Advertising for your Charity Fundraising Event on our Website, Social Media Sites, Club Notice Boards & in our Members Weekly Newsletter. Room hire includes a staffed private bar and the set-up of our standard tables & chairs to support your event. Catering & Entertainment options are available, please ask for details.